The practice is a family oriented general dental practice covering most aspects of dentistry and referring to specialists where appropriate. 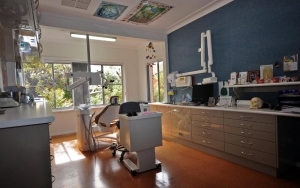 The practice is devoted to both general dentistry and orthodontics. Whilst he is not a specialist orthodontist, Stuart is an advanced practitioner in orthodontics and dento-facial orthopaedics. Our orthodontic philosophy for children is to correct bad habits early and reduce or eliminate more extensive treatments later. Where possible we try to see the face and mouth develop to its full genetic potential, which not only looks better, but is far healthier and usually eliminates the need for extractions. In treating adults, apart from improving smiles, we are often able to reduce headaches and improve the airway which in turn improves health, sleep and general well-being. We try to address why the teeth and face have become crooked, and what could result in orthodontic relapse. Stuart grew up and was educated in Sydney – graduating with a Bachelor of Dental Surgery degree from Sydney University in 1984. After a year working in two Sydney practices he and Deb moved to Inverell in 1985 to replace Dr John Northcott upon his retirement. John’s father, Stanley, began the practice in 1902, being joined by his son Hunter and then after World War II by John as well. So the practice has been operating continuously for well over a century.